What’s the big deal about Angelina Jolie’s lips, you ask? Oh there’s a lot to say, for a while, the actress was known as that ‘white’ girl with the big lips. We doubt anyone ever said it out, but it was implied, and not in a bad way either, it was just one of those things that made her one of the most beautiful and unique actresses out there. Well, you can ‘kiss’ her big lips bye bye, as the actress took it upon herself to have them reduced, nevertheless, her lips are still getting the attention they got back in the day and we have the figures to prove it, google registers 6,600 monthly searches for the term, ‘Angelina Jolie lips’, now that we have your attention, let’s get the low down. Most people go out of their way to get their lip size increased, no to name names , but we have people like Kylie Jenner (who denied it for a long period of time),Heidi Montag, Lisa Rinna and on occasion Britney Spears. Gone are the days that thin lips were in vogue, women today want fleshy lips. 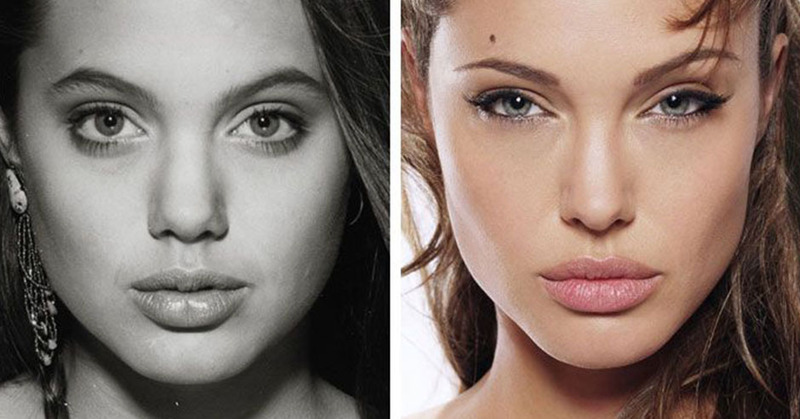 With the exception of Angelina Jolie, who got her lips reduced. It’s very evident, looking at a picture of the actress back in the day, you would notice that a couple of things have changed such as her lips, her nose, her skin. If you check it, a handful of people in the show business have full lips, so why all the hype about Angelina Jolie’s lips? Here’s why, big lips on a white person are considered to be aesthetically unusual, it’s more peculiar to the black race, hence the reason why actresses like, Viola Davis or Kerry Washington don’t get as much attention for having big lips. Compared to Jolie’s 6,600 searches a month, Kerry Washington’s lips get an average of 44 searches a month. So in a nutshell, all the hype is because she is a white girl with black girl lips. Well not anymore, Angelina Jolie’s lips are now white girl’s lips. Nevertheless, that did not stop a fan from trying to get some of that ‘Angelina Jolie’ type of attention. Keara hasn’t been able to close her mouth in ten years, thanks to a lip procedure gone wrong. She appeared on the E! reality show, Botched, to tell her story. After a bad break up, she let herself go and in a bid to make her feel better her mum arranged for her to get Angelina Jolie’s lips, after she expressed desire to have them. Well, that was one gift gone wrong, thank heavens they fixed her up. It’s natural to assume that Angelina Jolie’s house is also Brad Pitt’s house, the couple has been together for almost 12 years and married for two. They own a handful of homes together all over the globe, rather than the conventional house tour, let’s globe trot with the estranged couple today. In 2008, the couple purchased the Chateau Miraval, they have called it home since then and even got married there in 2014. The country estate sits on 1200 acres, and is located in the village of Correns, France. It dates back as far as the 17th century and features 35 rooms in the main house as well as several tenant residences, a recording studio and a prize-winning vineyard. The house has been valued and will be on the market any day soon. The asking price is yet to be revealed. In New Orleans, the couple own a $6.5 million mansion. The historic house is located in the French quarters and features five bedrooms and 3.5 baths as well as an elevator and a separate guest house. The house was listed before the divorce came into the picture. Meanwhile, the couple has an apartment in New York city. In 2007, they acquired an apartment in the Waldorf Astoria Towers, adjacent to the famed hotel, in New York City. After filing for divorce, the star has taken up camp in a 4,409 square feet Malibu residence that features 4 bedrooms, 4 bathrooms and 1-bed/1-bath guesthouse. The ocean-view property is owned by “X-Men” writer/director/producer Bryan Singer and was purchased in December 2010 for $8.5 million. Angelina was born on June 4, 1975 to Jon Voight and Marcheline Bertrand, the actress has one brother and his name is James Haven. Before Brad Pitt, she was married twice, first to Jonny Lee Miller from 1996-1999 then to Billy Bob Thornton from 2000-2003. She is in the process of divorcing husband number three, with whom she had kids with. The couple have 6 kids together, 3 of which are adopted. Their names are, Shiloh Nouvel Jolie-Pitt, Vivienne Marcheline Jolie-Pitt, Maddox Chivan Jolie-Pitt, Pax Thien Jolie-Pitt, Zahara Marley Jolie-Pitt and Knox Leon Jolie-Pitt.